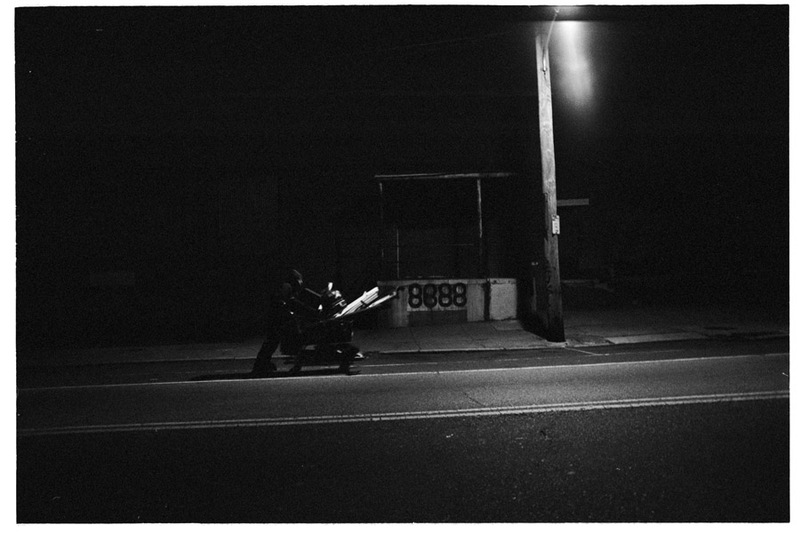 Last Fall I spent a lot of time in the darkroom printing the 35mm photos I took while shooting The Scrapper. I asked Joe to look at the prints and to write whatever the images made him think about. He lost his glasses, so he had a hard time seeing what he was writing. Today Joe and I recorded a commentary track for The Scrapper DVD. I haven’t seen Joe in awhile. Along with this recession the price for scrap metal has gone down considerably. Today it is worth half as much as it was a year ago. I just did this interview for Viva Doc in Chicago…Pretty fun. Jonathan Olshefski, an up-and-coming Philadelphian filmmaker, hit the streets during the midnight hours to follow and film the nightly routine of a “scrapper” ― you may know them as those drifting individuals who push shopping carts filled with metal scraps ― these vagabonds forage around searching for discarded waste, collecting junk with little to no value, in hopes to sell it and turn a profit. The result of Jonathan’s followings is The Scrapper, a 32 minute documentary short, which recently played at the Chicago Underground Film Festival and will also be screening at Viva Doc on Tuesday, March 17. 1. What initially sparked your interest and/or influenced you to pursue filmmaking? It started out in the mid-’90s making skate videos and ridiculousness vignettes containing some mixture of blood, poop and insanity (http://llscfilm.com). Back then it was purely social, purely fun, an excuse to hang out with friends and actually do something. I graduated from high school in 2000, intent on being a garbage man, but somehow found myself studying film at Temple University. My focus shifted from energetic, social spontaneity to weird, serious, personal projects as self-therapy. EXPERMENTAL! I got bored and added English literature as a second major and found my way into still photography and new media design. I graduated with no desire to pursue filmmaking. I continued to shoot stills of abandoned buildings and work low-wage construction. I always struggled with the desire to create and the desire to do something noble and worthwhile. I thought I would end up being a nurse, social worker, or teacher. I met a southern photojournalist (http://www.flickr.com/photos/alymae/) and after a short, tumultuous romance I was left feeling incredibly rotten, but also inspired to pursue photography as a means of storytelling/connecting. Rather than exploring empty spaces I would explore the humanity in Philadelphia. Two friends living from an intentional community called the Bruderhof introduced me to Sister Margaret and the good people of New Jerusalem Now (http://newjerusalemnow.org), a community of recovering addicts, and found my first story. Portions of this interaction can be found at Whispers in the Storm (http://whispersinthestorm.com). Magically, photography became of means to connect and to build relationships with people I previously wouldn’t relate to. From there I began teaching photo classes to recovering addicts and feeling like my two passions (aesthetics & social justice) were finally coming together. So, while I was doing all of this fun stuff I was also balancing being employed and being unemployed. I’d make a chunk of money then quit and try to live as long as possible on what I had made while pursuing projects that I was excited about. Then I started to make good money at a job I actually liked and I felt like I was beginning to lose my passion for documentary storytelling, so I had to decide whether to try and keep the job and balance it with everything else or just quit. I decided to quit. Then I had to decide should I just be unemployed and do projects, or go back to school and do the same kind of work in an atmosphere where I will be challenged and exposed to things I wouldn’t be exposed to on my own. So, I went back to Temple’s film school for my MFA and started shooting video and film to coincide with my stills. That’s where I am at today. The Scrapper was a product of my first year of grad school. 2. There’s the film school route and countless other routes. Which have you pursued and how would you describe the experience? See above. School is fun. I like my classmates. I like getting access to equipment that I don’t have to buy myself. I like teaching undergrads…but it’s a tool and it is working for me right now. By no means is it a prerequisite for good work. 3. What most immediately struck you about making a film about a scrapper subject and how does your film about a scrapper differ from the countless other documentary shorts that have been made about homeless individuals? I’ve always been interested in scrapping and the guys with the carts. My Grandpap scrapped all of kinds of things for me when I was a kid in Pittsburgh. That’s how I got my first Night Rider big wheel. Me and my friends used to scrap every Tuesday night to get things to break and set on fire for the movies we made in high school. For me, it’s all about exploring. The Scrapper actually came about as I was doing an observation assignment for a screenwriting class. I was sitting in this wild beer store in my neighborhood taking notes on everything that I was observing. Joe (the scrapper) came in and sat next to me and we talked about hockey for the next hour and he bought me a $1.25 24oz Bud Ice. It wasn’t until later that I found out the he scrapped. 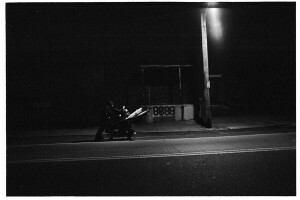 Later I saw him with his cart and told him I always wanted to do a project on a scrapper. I asked him if I could do a project on him and he was happy to have the company. How does my project differ? It is my project. My experience. Joe is a quirky, unique guy, but there are tons of documentaries about quirky individuals and their daily activities. He isn’t homeless actually. I guess that question shouldn’t be: why is it different?, but why does it matter? I think portraits of the lives of unseen populations are incredibly important as long as they are done collaboratively with the subject and with sensitivity. I believe that greater understanding leads to greater empathy. I would hope that this would develop into some sort of practical, beneficial change for these populations, but I am struggling with this concept right now. After passively consuming a story about someone different from you, do you treat people in similar social conditions any differently? Or, is it just another form of reality TV entertainment? …but ethics gets boring. These days I go with my gut, not my head. 4. How would you describe your guiding set of film making principles? Explore, listen, have fun, participate, respect, collaborate, learn, share. 5. The Scrapper screened at the 2008 Chicago Underground Film Festival. Did you attend the the festival? What’s your short-list of favorite films you watched? My wife gave birth to our baby boy, Caleb Lee, just three weeks before the Chicago Underground Festival, so I didn’t make it out. 6. Reconsidering your previous festival experiences and submission processes, what have you learned not to do, what to do, and how do you intend to improve your future submission processes? Name three festivals you have particular regard for. I’m new to the festival thing…I think it’s a little bit weird. I’d say start your own festival. Screen your own stuff. Create community actively. Don’t just pay $35 a pop through withoutabox and hope someone likes your work. If you feel good about your work, promote it yourself. I get rejected mostly, so I have a biased opinion. I was originally going to shoot all of the tracking sequences with the camera mounted to a single speed bike with a milk crate and inner tubes. The inner tube harness made for an interesting effect, was way too bouncy for my purposes. Above is a sped up version of that first test. At 33 seconds we pass Steak and Beer, which is where I first met Joe. I should take a picture of my apparatus someday. I didn’t end up shooting from the milk crate for the tracking shots, but it was nice to have a place to put the camera when we weren’t shooting, or we were going through rough neighborhoods. I just wrapped the camera up in a blanket making it pretty inconspicuous. I kind of felt like Elliot with E.T. In the Spring The Scrapper was awarded the prize for Best Documentary in the Diamond Screen Film Festival. We were also an official selection for the NextFrame film festival. This was taken right after showing a rough version of “The Scrapper” to Joe and the Cambria house crew. I was really pleased with Joe’s response. It was awesome watching with him because he provided extra commentary all the way through. Soon I hope to sit down and record a commentary track with him for the DVD. Oh yeah, Bud Ice is our beverage of choice! It’s definitely a Kensington favorite. This website will provide supplemental material for the medium length documentary “The Scrapper.” Soon I hope to upload a collection of 35mm stills that were taken during the shooting of the doc. I will provide updates on festival/distribution information and also updates on Joe and what he is up to. This was a really fun project and I need to thank Joe for being so open and supportive of this process. He really took mne under his wing and taught me a lot. In time I will describe how this documentary came to be.